Colour Haze, the Kings of the German Underground scene, is back with their new album. It was recorded and produced once again in Hannover by Willi. Lets just get into it... The CD starts with Aquamaria, which many might have heard on the bands Myspace web page. It starts slowly with the track building slowly, as a lot of CH tracks do. There is a lot of more complex interaction between Philip (bass) and Stefan (guitar), giving the track a more progressive rock, jazzy feel to it. Fire is next and a track that the band played a lot in 2005, but the track is totally different now. The track used to have a very short spacey part to start and then a killer very catchy guitar riff kicked in for a real rocker. The track is totally transformed here and the riff never appears and the track stays pretty laid back and is very emotional now. I liked the rocking version better but this is nice. Mind is built on a very groovy bass line and is a tuned down stoner rock groover and features a short Hammond organ solo. I felt this one could have become a great jammed out track. It just feels cut short here. Maybe they extend this one live?? Tempel, the title track, begins slowly once again, with some nice guitar harmonics and bass and this is a real showcase track for this bands musical talents. Brilliant! Gold and Silver is one of my favourite tracks on the record and has a very laid back groove and really nice vocals by Stefan. The Hammond is once again featured and Stefan does a great guitar solo. Earth, another track the band played in 2005, is the most rocking track on the album. Ozean is a short and dreamy instrumental track with some beautiful and spacey guitar playing. I really like that Stefan is adding some delay and has a new tone on this track. Thanks Stefan. Stratoform ends the CD and starts as a slow and building track with a really cool drum pattern. The dual layers of vocals and a nice effect and the great happy feeling of the guitar solo is great. 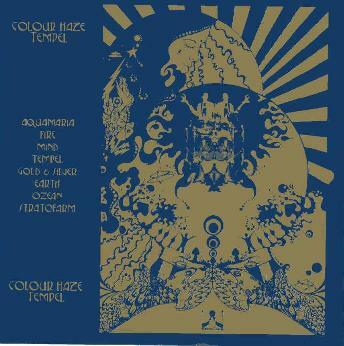 Well, Colour Haze proves once again that they are a brilliant band with great players and continue to write cool songs. This album has a much more laid back vibe than anything before it and Stefan has opened up a little bit on his guitar sound, offering us, perhaps, a glimpse into a move away from the sound being too much the same. True quality music. For more information you can visit the Colour Haze web site at: http://www.colourhaze.de.